Serve this Speedy Chicken Stir-Fry in just 25 minutes! 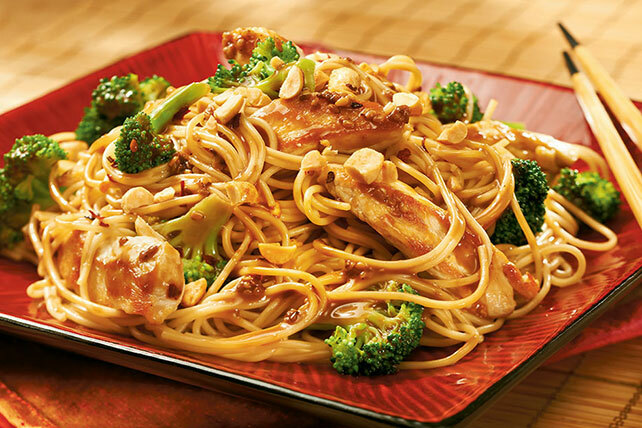 This savory Speedy Chicken Stir-Fry features tantalizing aromas and enticing Asian flavors. Cook pasta in large saucepan as directed on package, omitting salt and adding broccoli to the boiling water for the last 3 min. Meanwhile, cook chicken in large nonstick skillet sprayed with cooking spray on medium-high heat 6 to 8 min. or until done, stirring occasionally. Stir in dressing, soy sauce and seasonings; cook 1 min., stirring occasionally. Drain pasta mixture; place in large bowl. Add chicken mixture; mix lightly. Serve topped with nuts. Substitute whatever vegetables you have on hand, such as snow peas, bell pepper strips, sliced carrots or chopped red onions, for the broccoli.